Copper is a natural element. According to archaeological findings, this native metal was used in prehistoric times for tools, weapons and decoration. Copper is extremely malleable, so it would have been easy to work with, even with primitive tools. Cooper is highly conductive of both heat and electricity. This is why it is commonly used for wiring. Copper electroplating is often used for RFI (Radio Frequency Interference) and EMI (Electro Magnetic Interference) technology, due to its high conducting properties. Copper also has a high level of antibacterial properties, making it a popular metal finishing for laboratory and medical equipment. Brass is a copper and zinc alloy. 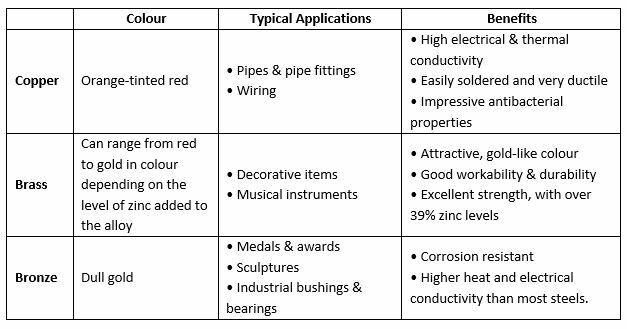 Varying the levels of zinc can create a wide variation in brass properties and colour. The higher the level of zinc, the stronger and more ductile the brass will be. Zinc is very corrosion resistant, so it increases the brass level of water resistance. Zinc plating is also a popular method for corrosive protection. Bronze is an alloy of copper and other materials, most commonly tin. Tin bronze (or ‘phosphor bronze) is a popular alloy because of its strength and fatigue resistance. However, arsenic, phosphorus, aluminium, manganese, and silicon can all be used to produce a bronze alloy. If you are looking for metal finishing or a plating company in Dorset, contact Dorsetware to learn more. Call our team today on 01202 677939 or complete our online contact form for a free quote.